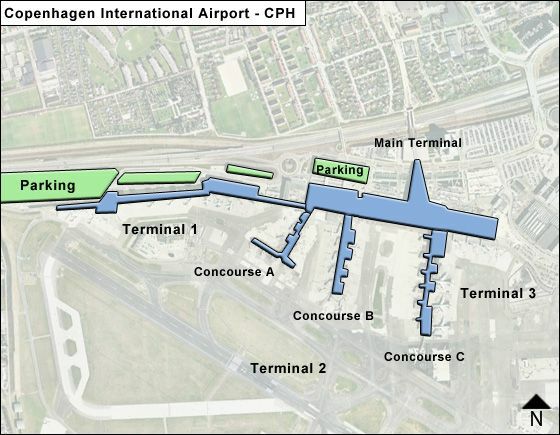 The passenger terminal complex at Copenhagen Airport, which previously had 3 terminals, now has an Integrated Passenger Terminal 1 (formerly Terminals 2 & 3; the old Terminal 1s no longer in service). A new Pier H will be built at newly merged T2. Terminal 1 is to be turned into a pier for newly integrated T2. Currently it may still handle some domestic flights (shuttles to T2 stop at the Western point of T1's level 2), while a shuttle bus may still run to/from T2. New integrated Terminal 2 (T2) with entrance in the center, and numerous concessions on either side - houses an abundant assortment of fashion & accessories, (women/ childen/ men's fashion & shoes), Delicasies & Kiosks, food & drink venues, including Food To Go, Living & Gift shops, electronics, Lego, Tax & Duty-Free, Currency exchanges by AMEX, & Danske Bank, and the following lounges: Aspire, Aviator, SAS & SAS Gold and CPH Apartment. Domestic flights park at central gates of Piers A, B, & C - close to check-in, baggage & security. - Passport control is in front of the C gates (which also have a Transfer Center), and at the entry of gates F1-F10. - The Boarding area houses a Transfer Center and the following lounges: Servisair Executive, Novia, SAS Business & SAS Scandinavian. Amenities & Services inside Terminal 2/3 include over 126 food, shop & services, including food & drink & retail concessions (an abundance of Men, Women & Children's fashion & shoes), duty-free shops, banks, Kastrup Ticket Office, Nursery, Airline counters, tax-free control, rental car desks, Global Refund & VAT, odd-size baggage, travel agency, Hilton desk, 2 LEGO areas for children & Transfer Center. The popular Copenhagen steak house MASH has a restaurant at Terminal 2's airside, while the new high-quality deli, the Food Market, offers wholesome food on the go.